Small ideas that help to save energy. Hivos' Seduction project. » Acts, not ads. I wrote about the Hivos piece-of-tape-to-save-energy-experiment earlier. The experiment is part of a broader effort by Hivos to enrich society with small ideas that help to save energy, the Seduction project. The basic idea is simple: ask someone to do something and he/she won’t do it. 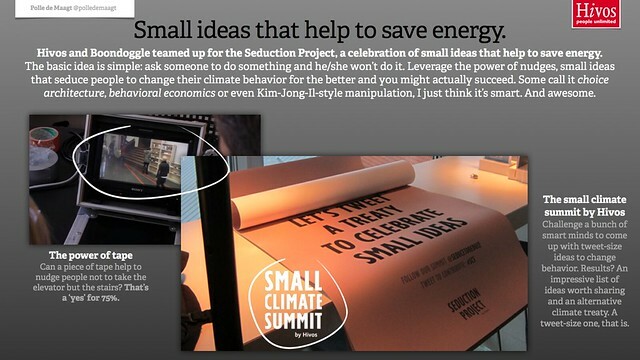 Leverage the power of nudges, small ideas that seduce people to change their climate behavior for the better and you might actually succeed. Some call it choice architecture, behavioral economics or even Kim-Jong-Il-style manipulation, I just think it’s smart. And awesome. The campaign consists of several initiatives; the experiment with the piece of tape, the light gun and most recently, the Small Climate Summit. The Small Climate Summit in Amsterdam was a mini-equivalent of the official Climate Summit (COP17) in Durban and housed only forty attendees. Purpose? To reach a crowdsourced climate agreement. The treaty consisting 10 tweets with small solutions to the energy challenge was instantly shared with the world via twitter. Followers watched a livestream on Facebook and tweeted suggestions of which the best were added to the treaty. The campaign takes Hivos beyond being a simple non profit organisation. Like Foursquare is all about making the real world easier to use, and Dogma is all for dogs, Hivos is now all about small interventions that make us save energy. And that, takes the ‘campaign’ beyond a ‘campaign’. It is a reason to communicate with consumers on a daily basis. A reason for people to join in on the cause and help Hivos to make the world a tiny bit more energy-consuming. And it is ‘campaignable’, which means that throughout the year, there are plenty of opportunities to turn these experiment into communication campaigns with high impact and reach. I really can’t wait to see the next experiment. Note: nope, I don’t have shares in Boondoggle nor Hivos. And Tom de Bruyne or Gaston Serpenti didn’t pay me either. I just think this is the way to go for brands and agencies.